In a world of ever-increasing choices in digital content experiences, 140 character limitations, chatbots, filters, conversational interfaces, and virtual reality, it may come as a surprise that senior executives still value long-form, research-based content and, yes, even the printed page for their business insights. 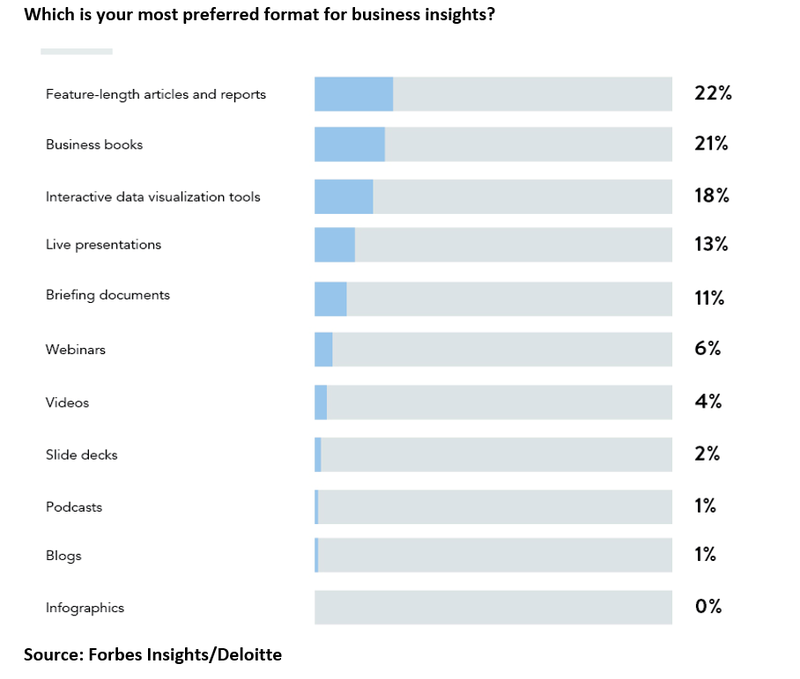 To find out how they want to receive business insights, Forbes Insights and Deloitte conducted a survey of almost 300 CXOs globally. We asked them about the types of content they want to read, what channels they prefer and where they get their most valuable business insights. Some of what they told us may surprise you. The report based on that survey, “Thought Leadership in Action: Strategic Content to Help CXOs Learn and Lead,” explains how to become a trusted, respected and sought-after source of thought leadership. The study shows that many C-level executives defy prevailing wisdom, with more than one-third of them preferring traditional longer data-based formats, in print. The interest in long-form content may seem counterintuitive. In the era of “snackable” and omnichannel content, CXOs do find value in short-form content. However, they consider it “icing on the cake.” The needs of this particular audience are key: CXOs need to think and act strategically. Thus, they often opt for longer pieces that take them from hypothesis, through case studies, to conclusion, and are based on credible data. While content needs to be designed for and distributed via multiple digital channels, there is still room for print, with half of CXOs saying that reading business insights in print is still important to them. Print tends to be the preferred format for taking in longer pieces. However, the preferred format also varies by type of publication. Output from consulting firms is usually read online, while management journals are consumed offline. Our analysis of how CXOs want to receive business insights shows that they are most interested in strategic content. Such content delivers a narrative based on curated data that spells out the hypothesis and proceeds to prove or disprove it. In other words, strategic content provides guidance and actionable takeaways instead of simply signaling issues by presenting reams of data. Thus, CXOs tend to favor organizations that can produce such long-form, credible content based on deep experience, which can help them set strategy or take the pulse of the market. 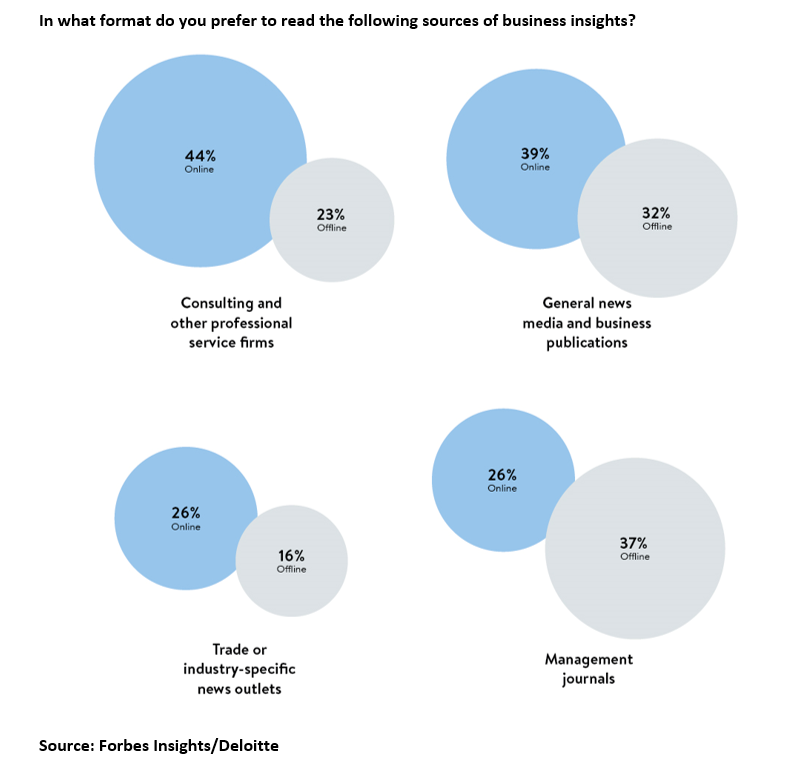 Business publications and consulting firms come out on top of the list. Different channels work for different types of content. This includes print, the most traditional—which is favored for longer pieces—and digital channels, which are preferred when reading general news media. What is most important is that each piece of thought leadership is presented on its most preferred channels for a given audience, and that it is designed for each specific channel to make it easily readable. Bruce H. Rogers is the Chief Insights Officer for Forbes Media. He is responsible for managing the Insights division, which creates and distributes thought-leadership, research-based content for blue-chip customers such as IBM, Google, KPMG, SAP, CIT, and Deloitte and he oversees the Forbes Insights content channel. He is also responsible for the company’s CMO Practice overseeing the group’s creation of content through the Forbes CMO Network section of Forbes.com, and events such as the annual Forbes CMO Summit. Prior to this role, Rogers was the Chief Brand Officer responsible for all integrated marketing, brand communication, research and sales support activities for Forbes Media.